The Pope hope he can be loved and accepted by all men, also the Turkish Prime Minister. Here inspecting an Islamic guard of honor in Ankara. Pope Francis spoke to Turkish authorities on Friday of the need to create a lasting peace – one based on a fraternal solidarity which respects human dignity and man’s essential right to religious freedom. By assuring the same rights to all regardless of their faith, each practice can more easily go beyond misunderstandings and see one another as brothers and sisters traveling along the same path. “Freedom of religion and freedom of expression, when truly guaranteed to each person, will help friendship to flourish and thus become an eloquent sign of peace,” he said, noting how the world, especially Europe and the Middle East, are waiting for this friendship. All followers of Jesus the Messiah is called to bless and love their enemies. But not by jumping to bed with them, but by sharing the gospel. The Pope seems less than interested in telling the truth about Jesus to the Turks. The Pontiff rather tries to build a global alliance of religious people, of all who can can accept his lordship. Those who fall for the philosophy and wisdom of the “Holy see” will be taken down the “the same path”. But not towards everlasting life, but in the directions of the gates of Hell. The Islamic regime in Ankara is as antisemitic as all the former Islamic Caliphate’s. 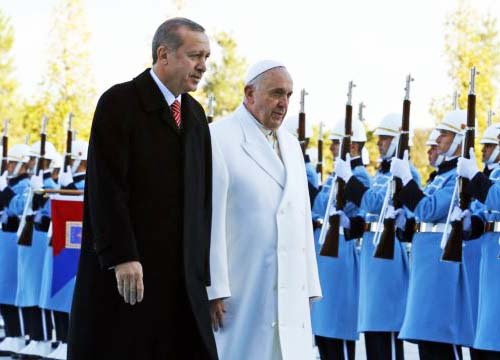 Still the Pope see in Turkey, a “a strong and fervent peacemaker!”. For all who have some basic knowledge about Islam, the word Islam means “peace” in the sense of submission. Whet the Pope desire is that Turkey should end the civil war between Sunni and Shia Muslim, by a fervent submission to “allah”. Only when the Muslim stop crippling and slaughtering each other, the One World religion can emerge, with a global leader being hailed as the “prince of peace”, which obviously also will be the “prince of Islam”. The Pope desire to become this leader. In the Bible this man is portrayed as the last man of lawlessness, an antichrist in the flesh. There is no better candidate for that post than the religious leader in the Vatican. Already 180 nations send their ambassadors to Rome to bow before the Pontiff. Only a few nations are not in submission. One of them is the Zionist state of Israel. But when Biblical Zionism is removed, the last man of lawlessness can enter the podium, and be hailed in the Old City of Jerusalem. Do not join this wicked movement of false peacemakers. But rather await the second coming of the true price of peace, Yeshua the Messiah. The pope is going to stay in Turkey for tree (3) days! It seems that they (the muslims and the vatican) have a lot to talk about. I`ve just read the two books written by Joel Richardson about the satanic islam and the beast from the Middle East. I think this meeting in Turkey is bad news for Israel and Christians who support the Jewish Nation.